With my organic radar firmly in place, I’ve known about Riverford for a very long time: my mother gets a weekly vegetable box, the vans drive past our door on a regular basis and our sadly missed local organic shop, which closed last year, stocked much of its veg. As a Soil Association (SA) member of many years, I have heard on-going reports and I am pleased that all the vegetables grown in the UK that find their way into the weekly boxes are SA certified. As well as their veg box operation, they have a handful of farm shops around the area and a restaurant with an excellent reputation – the Riverford Field Kitchen at Wash Farm, near Buckfastleigh, Devon. Where is the chocolate I hear you say? Well read on and hopefully, you won’t be disappointed. Guy Watson was the enterprising farmer who founded the business on the family farm back in 1987. From three acres and 20 local customers, things have literally mushroomed. It is now a multi-million pound business delivering over 40,000 boxes a week with a network of growers throughout the UK and beyond. Last year Guy won Farmer of the Year at the BBC Food and Farming Awards, no mean achievement. When I was invited to attend a tour of the farm followed by lunch at the Field Kitchen, I was delighted. CT, with his obsession for novel crops, got to come along too. We have been to the Field Kitchen once before, a few years ago, to hear a talk by Graham Harvey. It has lived on in my memory as one of the best meals I’ve ever eaten. We were very happy to find ourselves in the company of a select band of local bloggers. I’ve linked to their write ups so you can get a different take on the visit and see some better pictures! Natalie of the HungryHinny, a fellow member of the Cornwall Clandestine Cake Club and We Should Cocoa contributor. Grazing Kate who has organised a couple of South West blogger meet-ups which I managed to attend. Marcus of Country Woodsmoke, a blogger who is passionate about smoking food and who I’d met online but not in actuality. Frugal Queen (accompanied by her husband), a blogger I’d very strangely not come across before – strange because she too lives in Liskeard. The farm tour commenced with the packing shed which was impressively large and well organised. After seeing pallets of boxes packed full of juicy looking veg ready for delivery and crates of tomatoes and avocados, my mouth was well and truly watering. Next up, the field trip; bravely, we ventured outside into the cold and blustery wind. The fields are scattered over an extensive acreage, so we all hopped into a rather muddy and battered works van for a whistle stop tour of the winter crops. 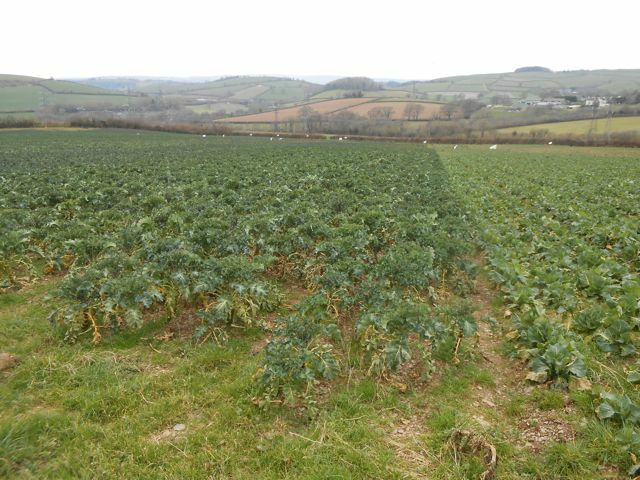 Fields of broad beans, leeks, kale, and my favourite purple sprouting broccoli were duly inspected. Guy had plenty to tell us and it was all very interesting. He talked with knowledge and passion about his crops and the challenges of growing them organically. We found out the fields are fertilised by the farm’s own dairy cows managed by Guy’s brother. Grass and clover leys are also used to maintain fertility. We had a quick walk up to the woods to see the wild garlic which was starting to come through and warned not to confuse it with cuckoo pint (Arum maculatum). In its early stages it looks similar to the garlic. but it is not only very unpleasant to taste but also poisonous. The last stop was the polytunnels, where Guy handed out sharp knives and encouraged us to gather our own greens. We all got to pick some of the delicious salad leaves that I always start craving at this time of year. The views were picturesque and quintessentially Devon. The farm is located in the South Hams which is particularly pretty with lots of interlocking hills, woods, hedges and varying shades of green. Chilled to the bone, but not in the least downhearted, we were rather glad to get into the warmth of the restaurant and see what delights awaited us. And delights there were aplenty. The Field Kitchen has an informal and sociable feel with long wooden benches for sharing with whoever else happens to be about. Bowls of food are passed around and diners help themselves to as much or as little of whichever ones appeal. If an intimate candelit dinner is what you are after, look elsewhere. Personally, I really like this way of dining. There were many nice touches including jam jars of local flowers and slices of blood orange in the water jugs. The food was as good as I remembered it, all very fresh and completely delicious. We started with bread made on the premises and a blue cheese, celery and apple salad with hazelnuts and radish sprouts. This was followed by a veritable banquet. I had the vegetarian option of course: griddled aubergine and ricotta cheese on a bed of butternut squash, lentils and spinach. I’m a bit funny about aubergines, but these were melt in the mouth delicious. The accompanying vegetables were so well prepared and varied, that I would have been very happy with just those: beetroots and carrots, celeriac, potato and mushroom gratin with rosemary, purple sprouting broccoli and cauliflower with mustard, spring greens and curly kale with wild garlic (ramsons). CT was more than content to tuck into the duck which he found both tender and flavoursome. He took little persuasion to take seconds and even thirds. I enjoyed everything I ate, but I think my favourite dish of all was the spring greens and curly kale with ramsons; the potatoes came a very close second. We were joined for lunch by Guy and two members of his PR team, Holly and Katie. As befits the setting, lively conversations and laughter erupted from our table. It turned out that Holly and Katie were both cake enthusiasts and seemed to be quite keen on chocolate too. There were lots of oohs and ahs over pudding. Head Chef Rob Andrew and the restaurant team had put on a large selection, all laid out on the counter for our delectation; we agonised over our choice – we were only allowed one. As well as sticky toffee pudding with or without custard (perfect weather for it), lemon mascarpone cheesecake, apple pear and fig tart and orange marmalade steamed pudding were on offer. There were also two chocolate choices: poached pear and chocolate pavlova or chocolate orange and almond torte. Oh my, what a dilemma. As I can never resist meringue, I plumped for the pavlova, but with a few backward glances of regret for what might have been. Katie, my guardian angel, saw my predicament and somehow charmed an additional slice out of the chef, so I got to have my cake and eat it – twice! It was worth it. A two course meal at £22.50 is not cheap, but it is excellent food and you are unlikely to go hungry. The ten of us at our table were unable to finish the dishes from the main course and could only just squeeze dessert in. All of the food is organic and the dining experience is lively and interesting. A few days later, we were sent a Riverford Veg Box to try. The choice of veg boxes is quite remarkable in terms of variety and size; ours was the small one. It didn’t seem that small to me and was packed with a good variety of fresh organic vegetables. We used to subscribe to a veg box scheme back along, before we had a plot to grow our own and although we were happy enough with it, we did get a little bored of the endless swedes in the winter months. No such problem here. We had a large crunchy lettuce, a bag of potatoes, carrots, a swede, calabrese, a cauliflower, tomatoes on the vine and a box of chestnut mushrooms. A couple of recipes and some farm news was also included, giving a personal touch to each delivery. The packaging used was minimal and the only non recyclable material was the plastic bag the lettuce came in. This is a massive reduction on the number of bags used to buy the equivalent produce in a supermarket. This box costs £12.99, which like the Field Kitchen is not cheap, but given the freshness of the produce, its organic status and its delivery to your front door, it is, I think, good value. Fruit boxes and meat boxes are also available and individual quantities can be purchased on line along with an astonishing array of dairy, store cupboard ingredients, drinks and baked goods – all organic of course. Look out for a Riverford giveaway coming soon. What a great lunch! I had a Riverford box for a while but unfortunately I didn’t find the produce to be particularly good. I think I live too far from Devon! Well that’s no good Alicia, good quality and fresh veg is paramount. I can only speak for the one I received, which was good. You can return your plastic bag to Riverford (leave it with the veg box itself for collection) and they will recycle it, which makes ALL the packaging recyclable. That’s useful to know, thank you. Recycle the plastic bag or re-use it? I’d be very pleased to hear they were being re-used. Great read, what an interesting day you had! It was interesting Nic, thank you. Fun too, I don’t get to meet up with other bloggers very often. Looks like a wonderful place and I love how you get to see the food before you get to eat it. days like this are what make being a blogger really worth while… what a wonderful time you all had! Love the chocolate almond cake! I turned their offer down, now I can’t believe what I missed, what a lovely day. Looks like a great day out. Don’t like the sound of the benches and tables – I’m so unsocial!